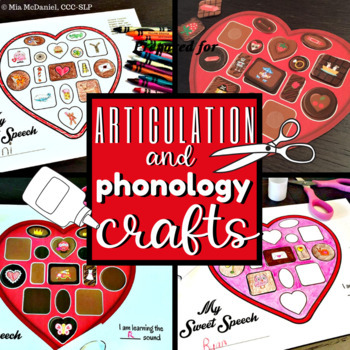 This is a sweet little Valentine's Day activity for addressing articulation and phonological processes. 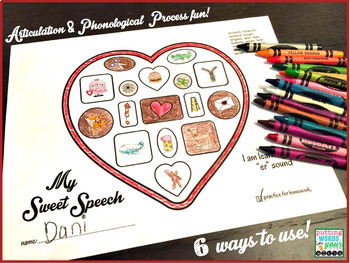 Use these pages to address articulation of any (and every) sound and the most common phonological processes! Since the speech targets in this download are pictures instead of text, it’s perfect for readers and non-readers alike. Each page addresses 1 sound in multiple positions (all pages are labeled by phoneme or phonological process). /r/, vocalic r (including variations), /r/ blends, /w/, /l/, /l/ blends, “y”, /s/, /s/ blends, /z/, sh, ch, j, /f/, /v/, /h/, /k/, /g/, /t/, /d/, /b/, /p/, “th”, /m/, /n/, initial consonant deletion, final consonant deletion, backing, fronting, stopping, gliding, weak syllable deletion, deaffrication, and blend/cluster reduction. 1) A coloring craft activity ~ make a black and white box of chocolates with lid (which will function like a flap). 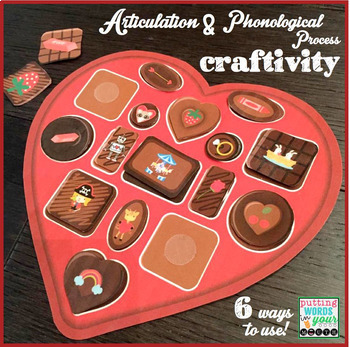 Use the black and white chocolate box lid along with a phoneme or phonological process page. Students should color the lid and color the heart depicting the inside of the box. After or as they’ve colored it, they should practice the target words on the page to your liking. If they are at the phrase level, give them a carrier phrase. If they are at the sentence level, have them make a sentence. If they are at the conversation level, have them tell about the pictures or tell a story that includes all the words. Lay the lid on top of the box interior and tape or staple the “lid” to the heart, creating a flap. 2) A color and practice activity that doubles as homework ~ Simply write target words or phrases on the chocolate shapes on the open ended page. Have students practice to your liking and send home for homework. 3) A coloring activity ~ Have students color the chocolates and target pictures on an assigned page. After or as they’ve colored it, they should practice the target words on the chocolates to your liking. If they are at the phrase level, give them a carrier phrase. If they are at the sentence level, have them make a sentence. If they are at the conversation level, have them tell about the pictures or tell a story that includes all the words. Send home for more practice! 5) YOU make a box of chocolates with velcro chocolates to “feed” to various critters and puppets in your therapy room ~ Print and laminate the box of chocolates interior. Then laminate the pages of one or more phonemes (I chose the print the most commonly errored sounds and processes of my students). Cut out the laminated chocolates and affix them to the heart shaped box with velcro dots. The result is a box of chocolates with chocolate pieces that students can peel off (remove) from the box and pretend to eat OR feed to a puppet or stuffed animal after saying the target word on it to your liking. With 16 chocolate targets for each box, these function much like an articulation deck would- except much sweeter! Use them over and over. 6) A simple cut and paste activity ~ assign each student a colorful set of chocolates based on his/her speech targets. Students will simply cut and paste for this activity. 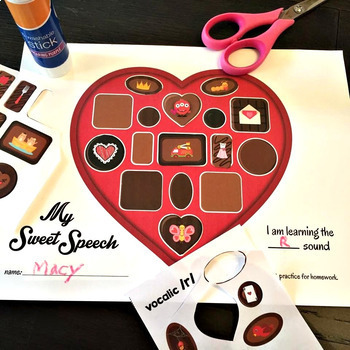 They should cut out the picture targets (chocolates) and glue them on the corresponding shapes on the heart interior while practicing the target words on the page to your liking. Send home as speech homework and/or display proudly for the world to see. Full directions are included. Download the preview for a much closer look! Check out ALL of my Valentine's Day activities HERE! Check out ALL of my ARTICULATION activities HERE! Thanks for stopping by and Happy Valentine's Day!